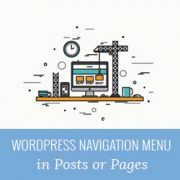 Do you want to display WordPress navigation menu in your posts or pages? Usually, your WordPress theme handles how and where navigation menus are displayed. In this article, we will show you how to add wordPress navigation menu in posts/pages or anywhere on your WordPress site. Navigation menus in WordPress provide an easy way to add a structured menu to your site. 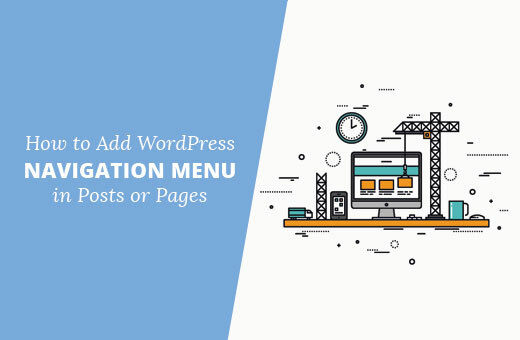 You can create as many navigation menus as you want in your WordPress admin area, but you can only display them on menu locations available in your WordPress theme. What if you needed to add a menu in a post or page? In that case, you will have to manually create a list of links which is not as efficient to manage as a WordPress menu. Having said that, let’s see how you can add navigation menus in WordPress posts or pages. First thing you need to do is install and activate the Menu Shortcode plugin. For more details, see our step by step guide on how to install a WordPress plugin. Before you can use the plugin, first you will need to create the navigation menu that you want to display. Go to Appearance » Menus to create it. See our beginner’s guide on how to add navigation menu in WordPress for detailed instructions. Once your menu is ready, you can add it to your posts using shortcode. Replace My menu with the name of navigation menu you want to add. By default, your menu will be displayed as a plain list. If you want to change the appearance of your menu, then see our guide on how to style navigation menus in WordPress. You can add your custom CSS for menus in your child theme‘s stylesheet or by using Simple Custom CSS plugin. However, if you are not familiar with CSS, then you can try CSS Hero. It is a powerful plugin that allows you to style anything on your WordPress site using a simple user interface and without writing any code. We hope this article helped you add navigation menu in your WordPress posts or page. You may also want to see our guide on how to create a table of contents in WordPress post or page. Great article, I use “menu shortcode” before but it not updated for year. It is OK to use it? Has anyone discovered an alternate plugin to the Shortcode Menu one (which is not supported and discontinued some time ago)? I had to make mine by hand, because of vertical listing (up to 50 page of content on selected topic) Simply doesn’t look good in page. As of plugin, this one is abandoned I believe. I found Shortcodes Ultimate by ( Vladimir Anokhin ) to be extremely helpful. Thank you!! I have been looking for a way to display a menu on a page that has a hover feature and this is perfect. My only issue is in the dropdown sub-menu the first link doesn’t align with the others. Is there a way to fix this in the Custom CSS without having to download the code hero plugin? What theme do you recommend for a small auto repair business that is only interested in highlighting its business using social media in English and Spanish? Thanks in advance. Great article but it is unfortunate that the Shortcode Menu plugin has not been updated for 2 years so probably not the way to go. Very helpful to know. I also like using accordion modules to show the subject and let the user decide if they want to read what is inside. What happened to you guys using Disqus? I though you migrated over to it. Any reason for switching back? We switched back to native WordPress comments. See our switching away from Disqus review. It might be nice to add a sentence to your post (https://www.wpbeginner.com/plugins/how-to-add-disqus-comment-system-in-wordpress/) to let people know that you are not using it anymore. Anyone who reads that article might switch over and then have to switch back again. Thanks!